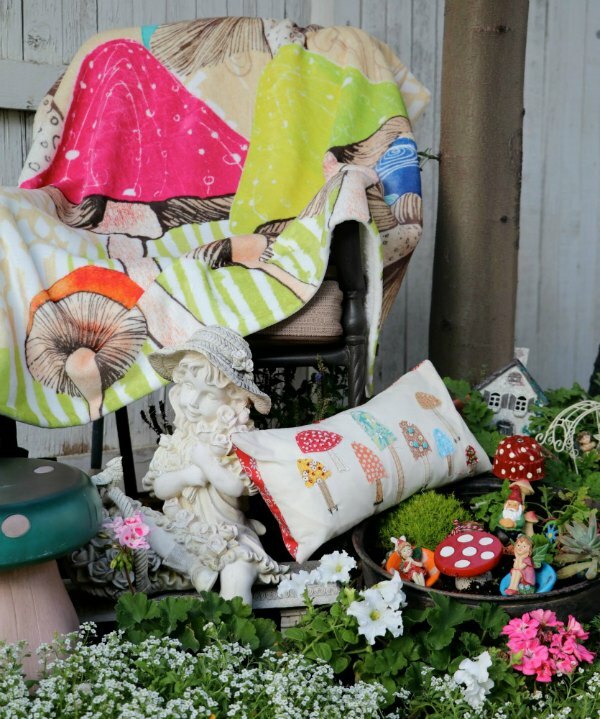 Do you have a favorite spot in your yard or garden? 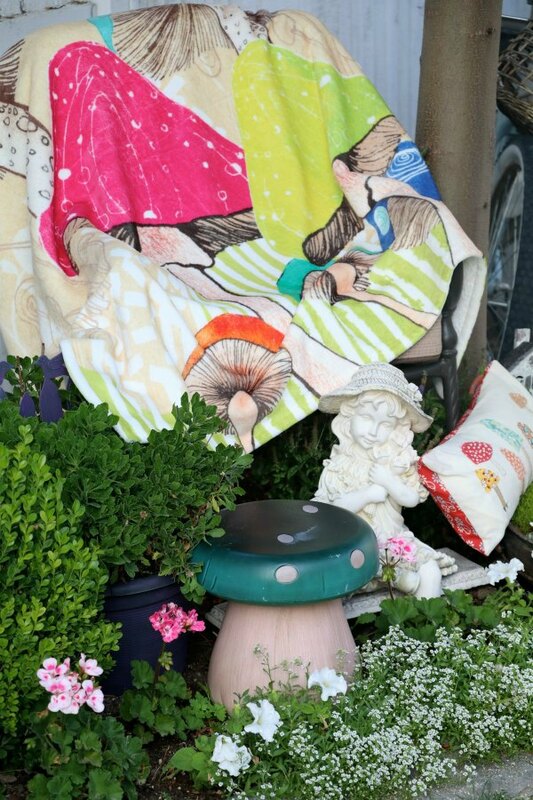 This year, quite unplanned I might add, my favorite spot is my little mushroom garden escape. As with just about anything I do or create it all begins with something quite small . . .
and then just grows into something quite lively, fun and enjoyable. My little mushroom garden escape all began with my craft group that meets monthly and the theme just happened to be mushrooms. At first I was a little skeptic thinking what on earth do you create with mushrooms in mind. Well, I was in for a little (actually huge) surprise when all of us showed up with different crafts to make centered around mushrooms. 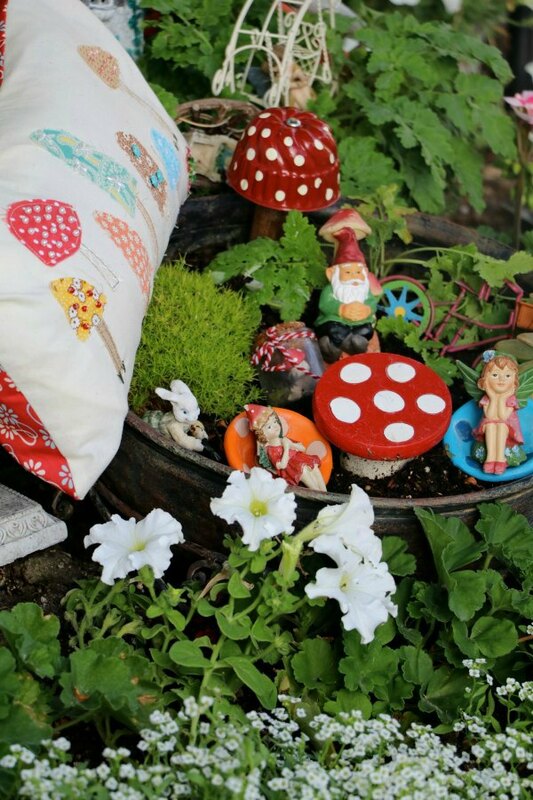 Jann had us all make these adorable pillows and Shirley had us make mushrooms out of muffin tins (cute, right?) and Kimi had us create mini garden terrariums. 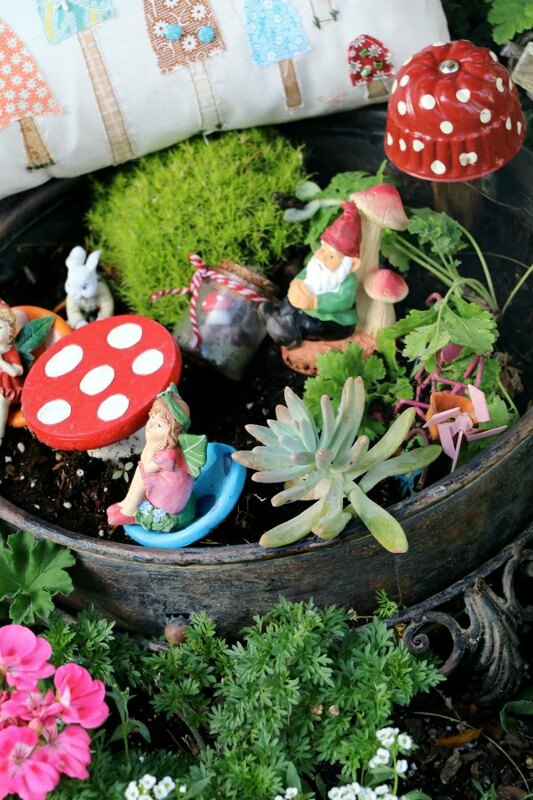 As I was creating mine I instantly knew as soon as I arrived home they were going to be the beginning of a new fairy garden. 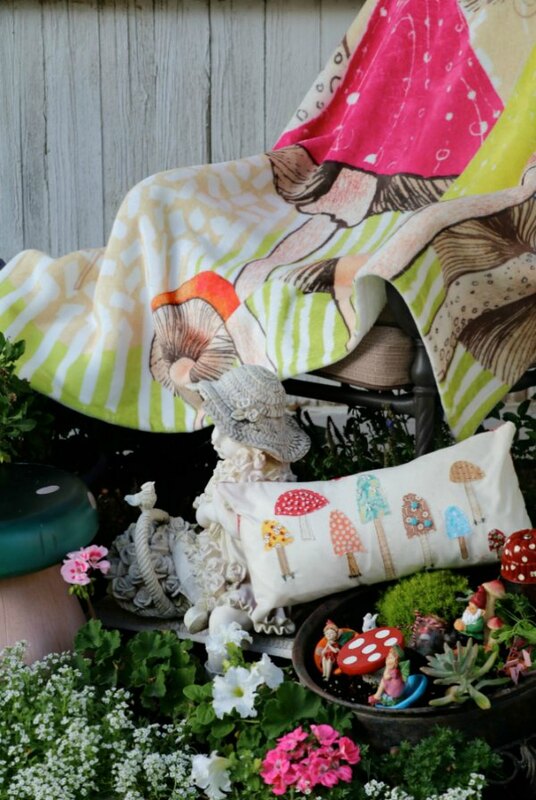 I simply couldn’t resist ordering this adorable and super duper soft minky mushroom throw. It’s perfect for early morning breakfast time and reading outside in the evenings. It will definitely make its way indoors for lots of use after the summer months. Oh, I didn’t come empyt handed to craft day, I had my cute friend creat a mini mushroom terrarium necklace. I just kind of gave mine to Miss Molly and haven’t got a photo yet. As always my friends, thanks for dropping by. Have a most wonderful day. 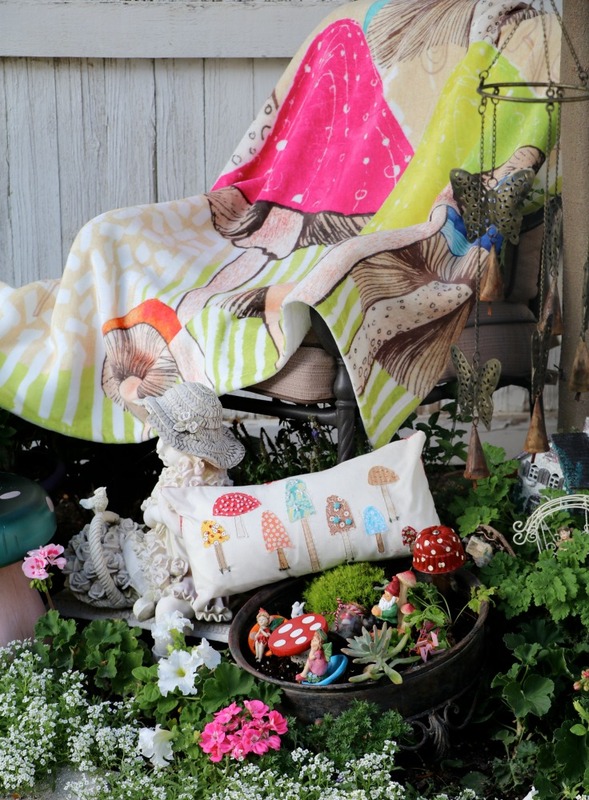 Oh my, what a fun little place to retreat and put up your feet Trina! You put it all together wonderfully. Such a fun and whimsical place. I love it! Thanks for sharing with SYC. How charming. I love it. I love your throw. What a perfect place to enjoy Fall. Speaking of I’m having a party. Come over and link this and all your Fall Themed posts!